This standing, altar-sized cluster of icy pale green datolite is from Dal’negorsk, Russia and is 3 lb 2.6 oz and 6.5” by 5” by 2.9”. She is elestial all over as she cascades over a somewhat arched quartzite base. 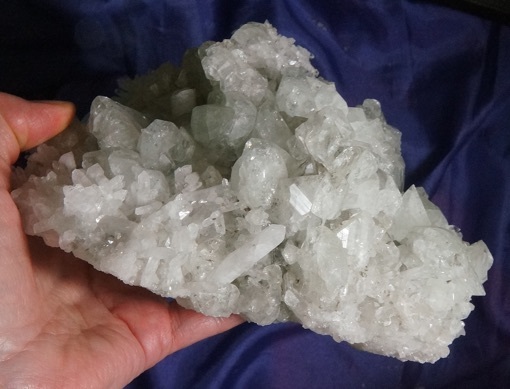 Her datolite is pale-pale glassine green with great clarity, intermixed with glittering little white laser quartz crystals. A loupe will show you the intricacy of expression of both the quartz and the datolite that only enhances the incredible energy and Spirit of this amazing mélange of crystals. The green color comes from chromium “impurities” in this rare borosilicate and you will be stunned by her beauty and even more amazed by her energy!